Welcome to the newest addition to the Choose Your Own Black and White Printables series. For those just joining us here’s the run down. Each week I’m sharing black and versions of existing printables. The series will run until the requests stop coming in or I run out of printables to convert. If there is a printable (or many printables) that you’d love to have a black and white version of, just click the link above to fill out the form and submit your request. This week kicks off the black and white undated monthly calendars. I don’t necessarily use an undated one for every month. Some months just seem to require a little extra planning room, but it’s not always things you want to clutter up your weeks with. But enough of my ramblings. Let’s check out the printables. 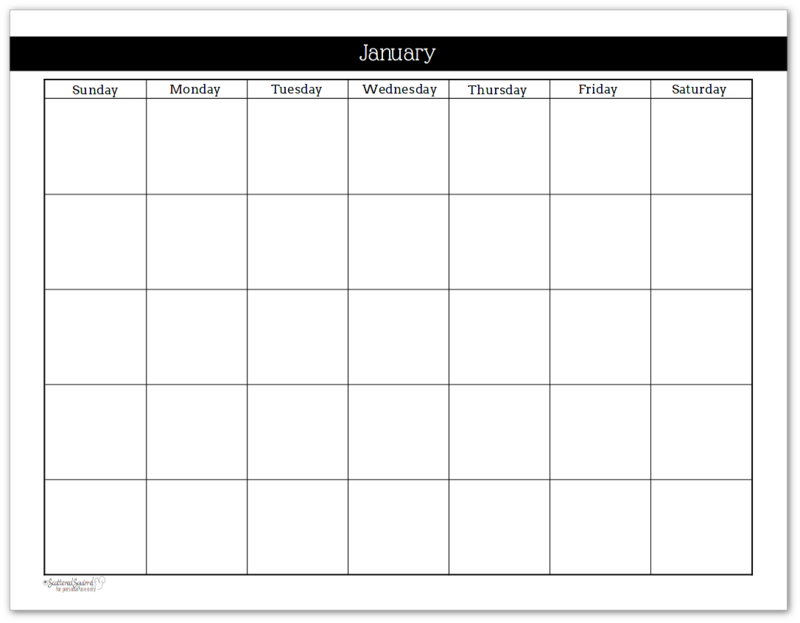 Undated or blank monthly calendars have been really popular requests so far. 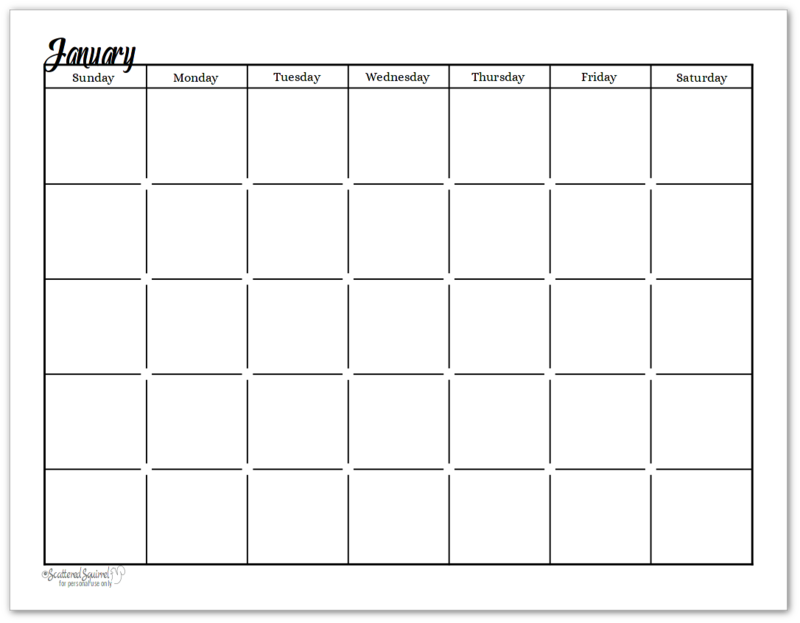 I have received at least one request for each size and each layout, which is a lot of calendars. So what I decided to do was to split them up by layout. 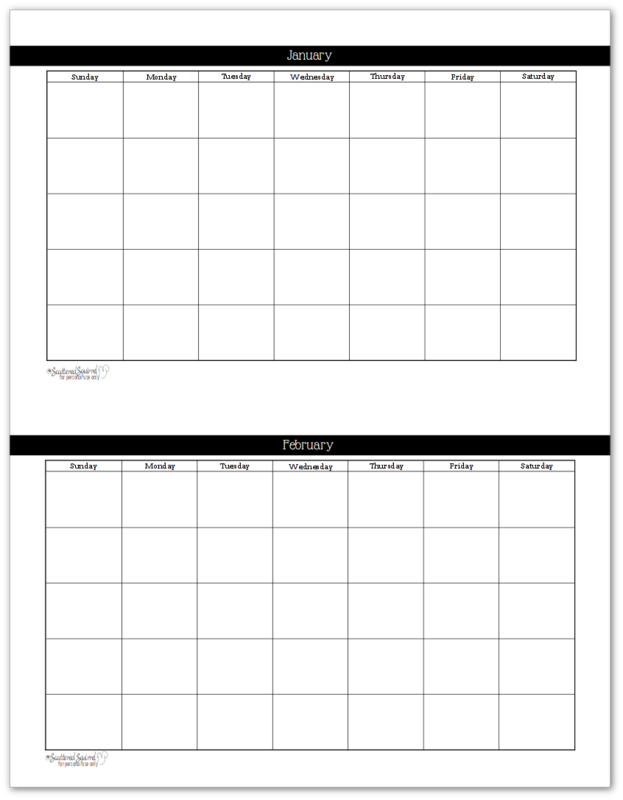 I’m kicking things off with the single page per month layout, and you’ll find both the full and half-size versions here in this post. Understated Rainbow is what I call the design from the 2016 calendars. After all this time, I figured the collections needed names to keep them all straight. Below are the black and white versions of this calendar. I went back and forth on whether or not keep the coloured bar across the top of the page. In the end, I kept it but don’t be surprised if I share a different version in a few months. The half-size ones are nice for making notes about bills to pay or for vacation planning or habit tracking. This is the name I’ve given to the 2017 collection of planner printables. I really love how these ones turned out in black and white. The script font really pops. The only real change I made to these ones is to remove the 2017 from the bottom right hand corner. One of my favourite things about these black and white undated monthly calendars, is that it’s so easy to dress them up with washi or stickers. Being able to personalize planner pages is bonus in my book. Also, coloured ink really pops on them. I find this especially helpful when colour coding projects, vacations, and other things. A quick glance can show you if you have room for adding in extra tasks. Now it’s your turn! 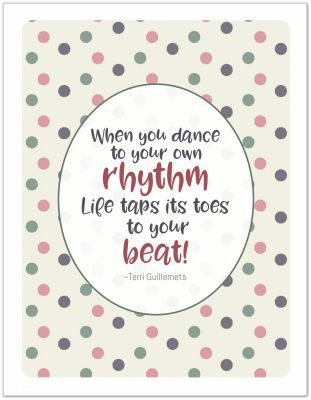 I’d love to hear what you think about these printables. Do you like undated calendars? If you use them, do you use them in a special way? Drop me a line the comments below and let me know. 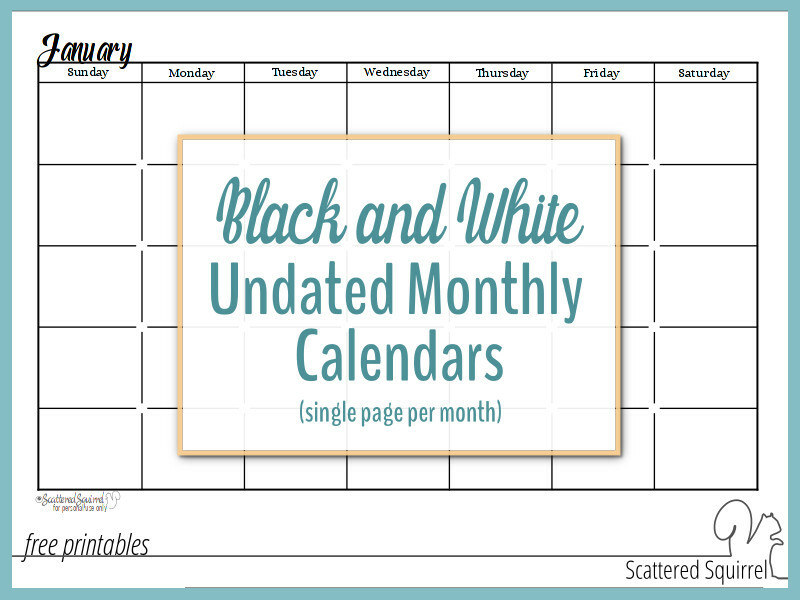 Next up will be the undated black and white calendars with the two page per month layout! 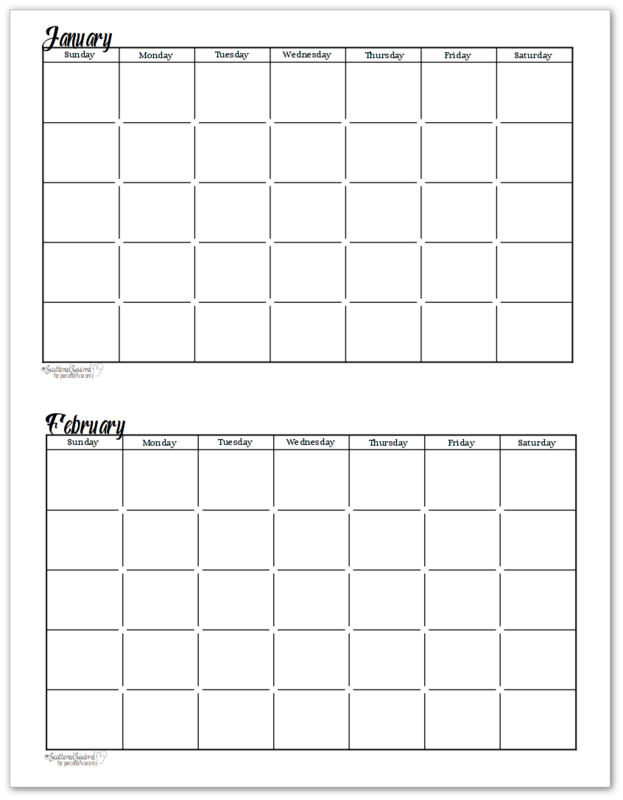 And be sure to check out previous weeks, printables on the Black and White Printables page. Previous Post: « Three Books to Make Life a Little Less Scattered. You never cease to amaze me! Thank you so much for your beautiful work!!! Hi Kimberly, I’m so happy you like them.